A recent visit to Washington DC by former Brexit secretary, David Davis, was funded by US business interests that want the UK to weaken its food and environment standards after it leaves the EU, according to Unearthed. 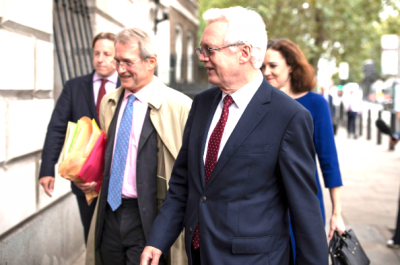 Davis visited the US in November 2018, together with former environment secretary Owen Paterson and the Institute of Economic Affairs’ (IEA) controversial trade expert, Shanker Singham, to discuss a post-Brexit US trade deal with the Trump administration. The group met with senior trade and agriculture officials before travelling to Oklahoma to meet with its Lieutenant Governor, Todd Lamb, and visit agricultural research facilities at Oklahoma State University. According to the register of MPs interests, funding for the trip was provided by several organisations, including the Institute of Economic Affairs and an Oklahoma business group called the E Foundation. Earlier this year an undercover investigation by Unearthed found that the E Foundation had agreed to provide tens of thousands of dollars in funding to the Institute of Economic Affairs (IEA), with the aim of influencing Brexit. Davis’ entry in the register reveals that the E Foundation paid £5,362 to cover the cost of his flights, accommodation and other expenses; while the IEA paid £1,949. The Chickasaw Nation, a Native American nation whose secretary of commerce, Bill Lance, sits on the E Foundation board of directors, also paid £4,052 to cover the cost of Davis’ flights. Some of the costs of Paterson’s trip were also covered by the E Foundation and IEA – but the majority came from the Chickasaw Nation (£4,052) and UK2020, a think tank of which Paterson is the sole director (£4,933). Paterson has frequently used his think tank, which does not disclose its sources of funding, to cover the costs of foreign trips. “They are entitled to answers. But to get them we will need to overhaul the way politics in this country works. The rules and regulations on funding, lobbying and transparency are simply not adequate to deal with the increasing complexity and global nature of the relationship between politics and big business,” Trickett continued. Davis, Paterson and the E Foundation did not respond to requests for comment when contacted last week. It is at least the second time that Singham has met with US trade officials this year, according to documents obtained by Unearthed under US freedom of information rules. During an undercover investigation by Unearthed earlier this year, the E Foundation’s CEO, Michael Carnuccio, said that its work with the IEA offered US businesses the opportunity to ‘get influence’ in the Brexit process. “If you’re looking for a way to invest resources in the US, to where there’s a tax deduction for the resources and there’s anonymity between it, that will get the resources deployed in the United Kingdom in a way that gets as much influence as close as possible and at the same time, creates a conversation and groundswell, we have the system already set up, that’s what we’re doing,” Carnuccio said. As part of the collaboration, the IEA arranged a meeting in London between representatives of the Oklahoma group and then Brexit minister Steve Baker. Singham also took them to a meeting of the influential European Research Group, where they addressed MPs and met Jacob Rees Mogg. One of the key aims of the E Foundation was for the UK to weaken its food standards as part of a post-Brexit US trade deal. “We quickly figured out that we’re gonna have to have some level of marketing, advertising, communications strategy that is going to impact the consumer in the UK but also from more of a political pressure standpoint, it will challenge the narrative that the EU has always had,” he continued. To help achieve this, Carnuccio said that a visit of Brexiteer MPs was being planned, which would involve a tour of Oklahoma agricultural facilities to help persuade British shoppers US products were safe to eat. He claimed that then Brexit minister, Steve Baker, was working with Singham to identify which MPs to take. Davis, Paterson and Singham’s trip to the US bears a close resemblance to the plan outlined by Carnuccio, involving a tour of agricultural facilities at Oklahoma State University, organised by E Foundation executive committee member and former cattle rancher, Tucker Link. The two former ministers also met with Syngenta, a major agribusiness firm that manufactures neonicotinoid pesticides and genetically modified seeds. The news comes after a Charity Commission investigation forced the IEA to withdraw a high-profile report on Brexit written by Singham and trumpeted by Davis and Paterson as an alternative to May’s Chequers deal. The Charity Commission acted after opening up a compliance case looking into allegations of political campaigning by the IEA, which is an educational charity, following the Unearthed undercover investigation. The IEA has now said it will split into two with a new non-charitable arm.